Those who don't live in the capital city would pay a higher admission fee at the 27-acre park. 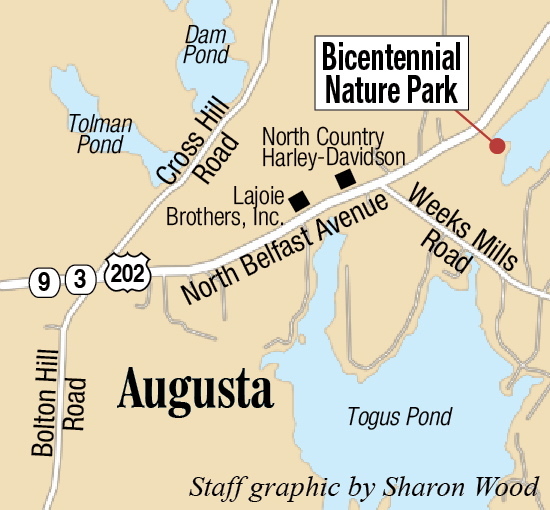 AUGUSTA — Supporters of Bicentennial Nature Park want to let those who don’t live in the capital city use the swimming and picnic spot for a higher fee, but some officials are concerned that the change would upset an agreement with nearby landowners and cost more money than it’s worth. Members of Friends of Bicentennial Nature Park, a group that raises money to help offset the city’s expenses running the city-owned park, want to allow those from outside the city into the lightly used park as a way to boost revenue and be neighborly. Clukey said Monday that residents of nearby towns — Chelsea, Vassalboro, China and other area municipalities — have asked why they aren’t allowed to use one of the only natural public swimming spots in the city. She said that Augusta residents are allowed to bring guests from outside the city to the park. The friends group proposed to the City Council Thursday that non-residents be charged about twice what Augusta residents pay to use the 27-acre wooded waterfront site on Three Cornered Pond. The site was established as a city park in 2001. It closed for one season three years ago because of city budget shortages. Kevin Jones, president of the Three Cornered Pond Association, said Monday he has no problem with non-residents being allowed in the park, but he hasn’t been able to ask most of the members of the association what they think because many of them aren’t at their seasonal pond properties yet. Opposition from those who live around the pond was one of the concerns of city officials at Thursday’s council meeting. An agreement was struck between the city and residents around the park on Three Cornered Pond, many of whom initially opposed its creation, limiting capacity at the park to 150 people at a time. Clukey told the council both the Parks and Recreation board and the Friends group favor the proposal, which would not increase the daily capacity at the park. She suggested Thursday the city try letting in some non-residents at a time when the park is rarely at capacity. Leif Dahlin, city services director, speculated at the meeting that the city wouldn’t sell more than 30 or 40 season passes to non-residents. Last summer the city sold 81 season passes to residents, most of which were family passes, and the park had 1,192 visits for the season overall. Dahlin said daily attendance fluctuates dramatically depending on the weather, but the park can accommodate more visitors without exceeding its current capacity. “Bottom line, there is still capacity to accommodate more folks at the park,” Dahlin said. City Manager William Bridgeo said when the city first planned a park at the site off Route 3, which is also North Belfast Avenue, it was an “aggressive” design that would have cut down numerous trees and included parking for more than 100 vehicles. Residents and camp owners on the pond complained that the city’s plans were too grand, would be disruptive to the pond and also contribute to problems with phosphorus in the water, Bridgeo said at Thursday’s meeting. In response, the city scaled back its plans, limiting parking to about 55 vehicles, establishing the 150-person capacity, banning launching motorized watercraft from the park and non-residents. Bridgeo credits the agreement and the city’s good stewardship of the park over the years as turning some residents who were first opposed to the park into some of its biggest supporters. But making changes to those rules could upset that relationship, he said. Jones on Monday agreed with Bridgeo’s assessment that pond landowners were at first skeptical about a public city park opening there, but have come around. “The city has been a good neighbor,” he said. He said he’s concerned that the city may consider selling the park. Residents pay to use the park ranging from $1 a day for children, veterans and seniors up to $25 for a family pass for the summer season. Clukey and Dahlin estimated that non-residents would be charged around twice as much as residents. The extra revenue could help offset the loss of some money collected by Augusta Rotary, which in each of the last few years has raised and donated thousands of dollars as part of an annual $5,000 or more in contributions made through the Friends group. Friends officials have told the city that the Rotary’s effort was a temporary one to keep the park open, and the money will no longer go to the park. Bob Dodge, a member of Augusta Rotary and the Friends group, said Rotary members will still likely donate to the park individually, but the park would no longer be the club’s big annual fundraising project. He said the club’s project of the moment is renovating a room at the Bread of Life Ministries shelter. Dodge said the club has not yet decided whether it will make a donation to the park this year. In 2012 the City Council closed the park to save about $40,000 a year. By the summer of 2013, however, the Friends of Bicentennial Nature Park, together with the Rotary Club and others, raised thousands of dollars privately to reopen the park. It has remained open since, funded by a mix of private and public money. Dahlin said the park’s proposed budget for the coming year is about $30,000. Revenues in that budget include $5,000 in contributions from the Friends’ group, $3,000 from sales of season passes and daily admissions, and $21,627 from property taxes. Bridgeo, who expects to release the proposed city budget this week, said funding for the park is included in the budget and there are no plans to close it again. However, he and Mayor David Rollins suggested councilors delay a decision on the non-resident admission proposal until they have a chance to review the proposed city budget over the next several weeks. Bridgeo and city councilors are also concerned that having someone at the park collecting the additional fees could cost more than those fees bring in. Now, park staff get to know most season pass holders and generally collect fees from residents once they are already inside the park. He noted if attendance at the park increases with the potential addition of non-residents, the city may need to beef up its collection process, which could add expense. Minor corrections have been made in this story.